DC’s Dark Days, Dark Nights, and Metal have been a hit. Not only the regular series but also the spin off one shots and mini series. One that people have been looking forward to was the Immortal Men #1 which was set to introduce a slew of new characters. Well, that’s off. According to Diamond Comics Distributors ordering system the series which was scheduled to ship 12/13 had been canceled. No reason given at this time. Update: DC has now announced that the books have been pushed back a month to allow retailers a chance to get a preview copy so they can “order with confidence”. Sorry James the 4th, Jim wants to play in the Bendis sandbox for a while. Haha.. I’m not a Bendis fan but his writing is definitely superior to Tynion. Might just be postponed. The same thing happened with Batman and the Signal, which is coming out starting in January. Could be. But it is showing as canceled and not delayed on Diamond. 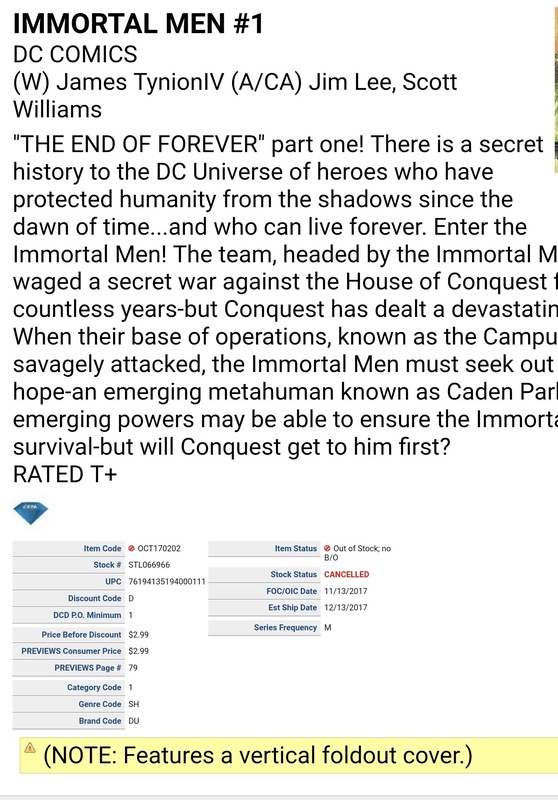 If this was part of the “New Age of DC Heroes” releases, DC pushed them all back to 2018, even though many of them were already solicited with release dates. I know Damage was one of the titles I pre-ordered that was supposed to be out in December, but is now pushed back. DCcomics.com has the release date for #1 on 3/14 now. Immortal Men #1 will be resolicited in the January PREVIEWS with a new on-sale date of March 14, the same date as Dark Days: Metal #6.